Publications | O. W. G.
Welcome to the publications section of our website. From here you can see a list of all our publications. We were invited to contribute to the Made in Oldbury project and write poems and short stories inspired by old photos found in the Sandwell Archives. The stories and poems were put together and printed as the first Oldbury Writing Group newspaper. Read online on the Made in Oldbury website. 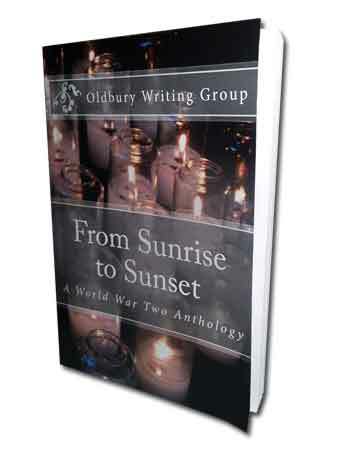 From Sunrise to Sunset is an anthology of short stories and poems that explore the lives of all individuals around the world who fought to survive during World War Two. This anthology speaks about a mother’s grief, the women who worked hard to help the war effort, the suffering of the Jewish communities, the dying thoughts of men, the brutal treatment of those living in concentration camps, and the people who fought on the other side, plus so much more. You will find stories and poems about the Caribbean, India, Malaysia, Poland, Britain, Germany and so many more places. Available to buy from Amazon and all online book retailers.